Join American photographer Amy Shutt and Canadian photographer Shane Kalyn of The Canid Project for a canid-centric workshop photographing and learning about the Red Foxes of Washington. Our aim with The Canid Project workshops is to provide experiences that will not just focus on the technical and aesthetic aspects of photography, but also on how you can use your photography for conservation and education. We also focus strongly on the ethics of wildlife photography. Each workshop is led by carefully selected ethical wildlife photographers. When applicable we strive to work with conservation-based organizations and projects that provide unique and intimate information throughout our workshops by way of professional researchers and biologists. Our workshops target canid species and areas and the issue or efforts that directly affect these species. We hope to be part of the solution by educating. Proceeds from these workshops go directly to The Canid Project to help fund educational endeavors and outreach, as well as the fox rehab in Louisiana. June is a great time for urban fox families because the den sites are active with older kits ranging in age from approximately 2 to 4 months old. This provides a great opportunity for not only pictures but for learning how to approach urban wildlife ethically, which is our main goal with this workshop. Nowadays we don't have to go "out there" to experience wildlife, all we have to do is take a look right outside our back doors. Amy Shutt has a formal background in photography and education and Canadian photographer Shane Kalyn has a formal background in biology and wildlife management. Both Amy and Shane have spent many years photographing wild foxes and together they will use their keen understanding of fox family dynamics and behaviours to get you in the best position to create beautiful photographs, while at the same time respecting our subjects and acting ethically in our approaches. Located in the beautiful Pacific Northwest, coastal Washington is a magical place. We will be venturing to a coastal gem to unwind and escape from it all. The area is a nature lover's dream and a biodiversity hot-spot, boasting a rich diversity of flora and fauna ranging from orcas, bald eagles and sea lions to endemic populations of rare butterflies to rare and endangered Garry Oak ecosystems. 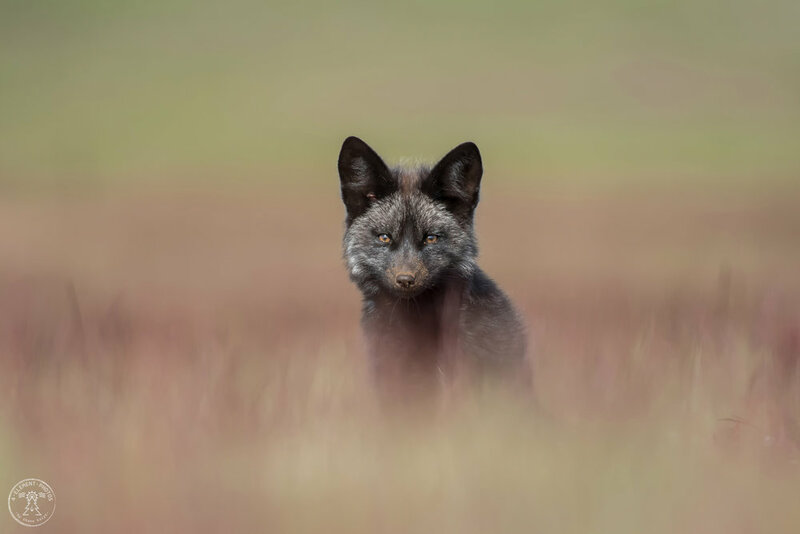 This area offers unique opportunities to photograph foxes in scenic coastal, grassland, forested and even urban settings, offering photographers the ability to create a variety of stunning images. The foxes themselves are unique, and it is possible to see and photograph several distinct colour pelages ranging from the more common red, cross and silver colour phases to the rarer grey pearl and, if you're lucky, the elusive cinnamon pelage! Unique to this location is the fact that these foxes were released into the area from local fur farms, and perhaps also from live trapped and released, to help eliminate a overpopulation of rabbits (which were also released in the late 1800s). These introductions are presumed to have taken place in the first quarter of the 20th century and again in 1947, according to “old timers’” stories and the trappers’ harvest records via the Washington State Dept of Game. In the 80s it was unknown if there were any foxes in the area, but now the population has clearly rebounded. While the melanistic “silver” and partially melanistic “cross” mutations are seen in the wild, the others are not. These interesting pelage colours that are only seen in this area are the result of the introduced foxes being fur farm stock. The colors are selected for in the breeding foxes of fur farms and rarely, if ever, seen in the wild. You can liken it to the pelage colorings of domesticated animals like black and white cows, dogs, and cats; these odd-ball colors are not seen in their ancestral wild counterparts. Why not? Simply because it doesn’t help them to blend into their environment and has never been selected for in the wild. And while we can not guarantee seeing foxes of any age, June is the perfect time of year to photograph these foxes and it is common to be able to photograph multiple active den sites, often with multi-coloured litters, so the chances are very high. June 4, 2019 / Tuesday: If you arrive before 7pm on this day, please enjoy a meet and greet with Shane and Amy. June 5, 2019 / Wednesday AM: We will meet in the morning over breakfast for a presentation by Shane and Amy. We will also discuss the workshop and logistics in detail. June 5 - 7, 2019 / Wednesday to Friday: Three full days of in the field shooting, and reviews. Detailed shooting itinerary will be provided on June 5th. The workshop will conclude the evening of June 7, 2019. Warm clothing for early mornings and late afternoons. Bug spray is a good idea! It's a good idea to have travel insurance in case something goes wrong or trip cancellation. Amy loves World Nomads travel insurance. Once your deposit is paid you will receive a full itinerary with detailed information about the workshop and your lodging. Amy loves World Nomads travel insurance! Please send any questions you have in the message area below. Amy Shutt specializes in nature and wildlife photography with a recent focus in photo-documentary projects. A formally trained and published photographer, Amy also teaches various photography classes and workshops throughout the United States and in Africa. Her interest in foxes and coyotes, background in wildlife rehabilitation, and curiosity about the human and wild animal relationships in our world, brought her to start The Canid Project. She hopes to preserve, educate, and inspire through this endeavor.